Respak: a greener packaging for the environment! The food industry uses packaging made from a variety of materials, including plastic, cardboard, polystyrene, and I could go on. Did you know? Across the world, two tonnes of polycoated cardboard are used every minute – that’s enough to cover the Empire State Building three times/hour! After several months of research and development, we are launching a new ecological packaging: Respak! What kind of cardboard? Polycoated cardboard is boxboard that has been covered with a transparent polyethylene film, making it resistant to grease, oil and water. The film is necessary for different types of food containers, such as croissant boxes, containers for soup and pasta, etc. It prevents the cardboard from absorbing liquid, and maintains its durability. 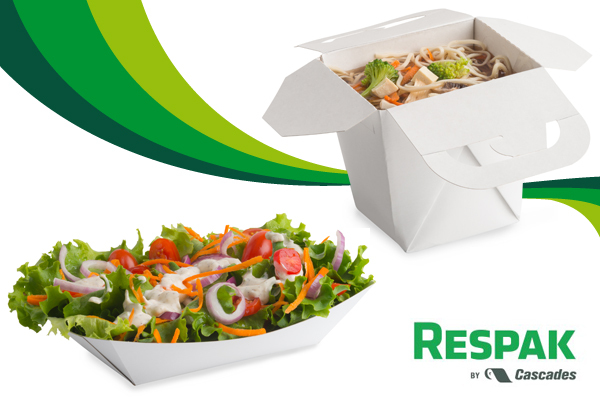 Respak is a new cardboard container that is recyclable, compostable and made from 50% recycled fibres. Respak has a unique and revolutionary barrier that repels water, oil and grease just as efficiently as ordinary polycoated cardboard. We are very pleased to be the first to offer the packaging and food industries, as well as consumers, this new green packaging that will significantly reduce the impact of food consumption on waste. Based on results from a preliminary life cycle assessment, Respak’s environmental impact is 50% less than that of the polycoated cardboard currently in use. Respak complies with the main food safety standards, including those established by the Food and Drug Administration for packaging that comes in contact with dry, aqueous and fatty foods. Elemental chlorine free (ECF) and FSC®-certified, this innovation from Cascades has a bright future on the food packaging market. Learn more about the product by visiting www.cascades.com/en/respak, and start using it today. The next time you’re in a restaurant or grocery store, take a look at what kinds of containers your food is served in!